PO-K Loco has opened its doors on Fry St. and is serving up fresh, tasty goodness. 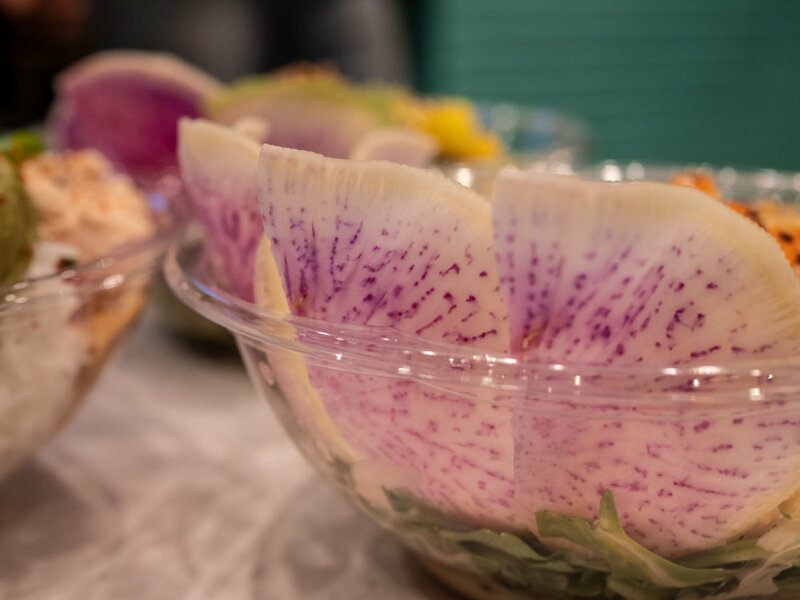 Featuring classic bowls, a variety of vegetarian choices, and the option to make your own bowl, there is a little something for everybody. 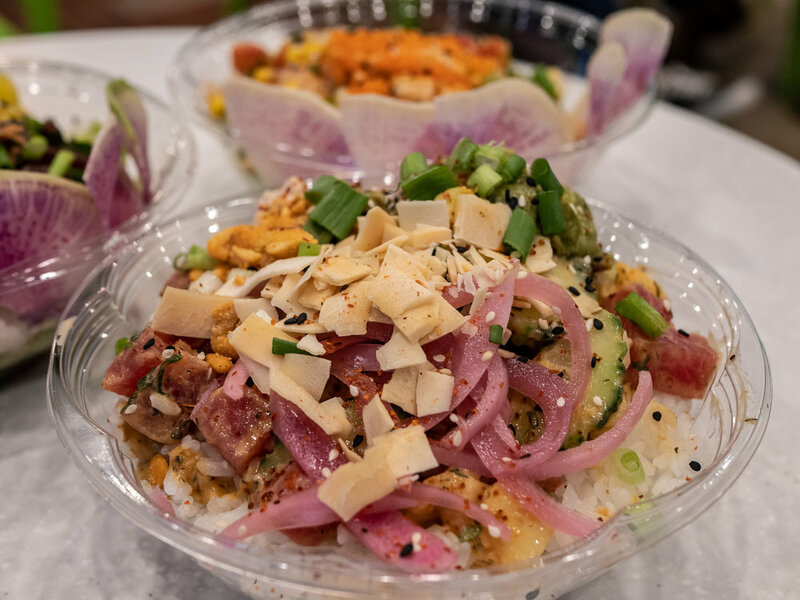 The cuisine brings something different to Fry St. Next to the beloved Crooked Crust and Jimmy John’s, you can brighten your day with one of their yummy poke bowls that come with authentic Hawaiian flavors or some Latin flair. 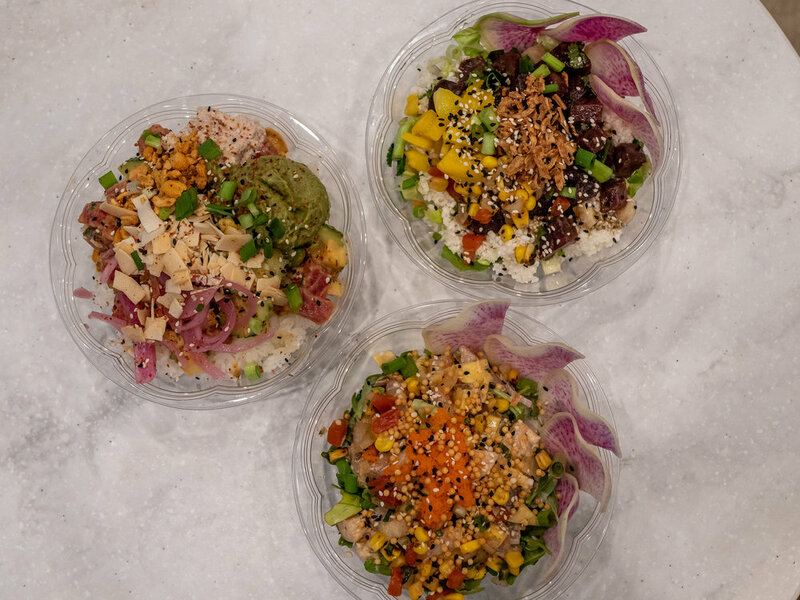 The perfectly portioned bowls are the ideal grab-and-go, and you can scoop up some Seaweed Snacks or Aloha Hawaiian Juice to make these cooler temps melt away into the tropical ambiance the space has created. They also feature Maine Root Sodas and some award-winning iced tea that is brewed from loose leaf with two options: the apricot mango and ginger detox tea. The staff is enthusiastic and passionate about their product, offering up ideas when the decision is just too difficult to make. 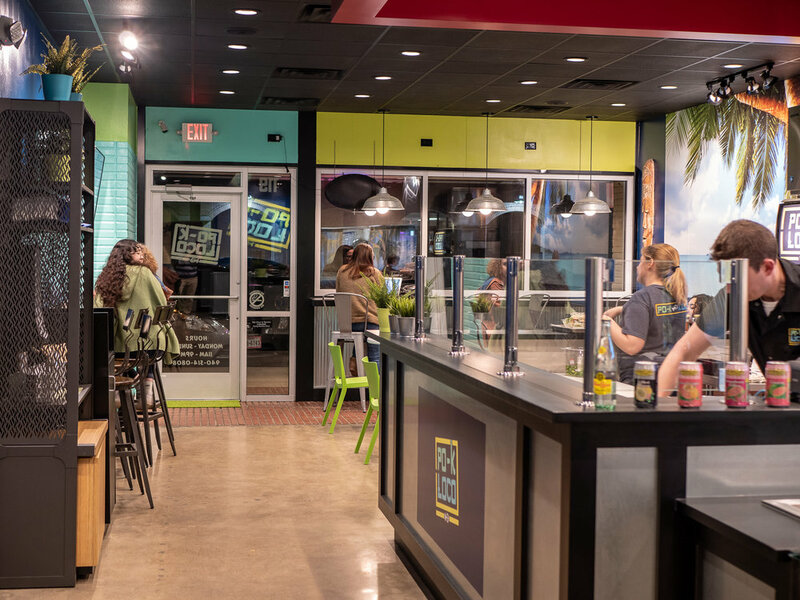 With a bright and relaxing atmosphere inside, you can also choose to grab a seat at the convenient outdoor bar if you’re craving sunshine to go with your poke bowl. Micah Fleck is leading the charge and serves as an amazing guide through the menu. Make sure to give him a high five when you stop by! Before you choose your bowl, select your base! Options include sushi rice, arugula, romaine mix or cauliflower rice. Some of these are a little easier to eat with a utensil, and they have forks and chopsticks on hand. When selecting your add-on options, make sure your bowl has something sweet, savory and spicy to get a perfect balance of complimenting flavors. 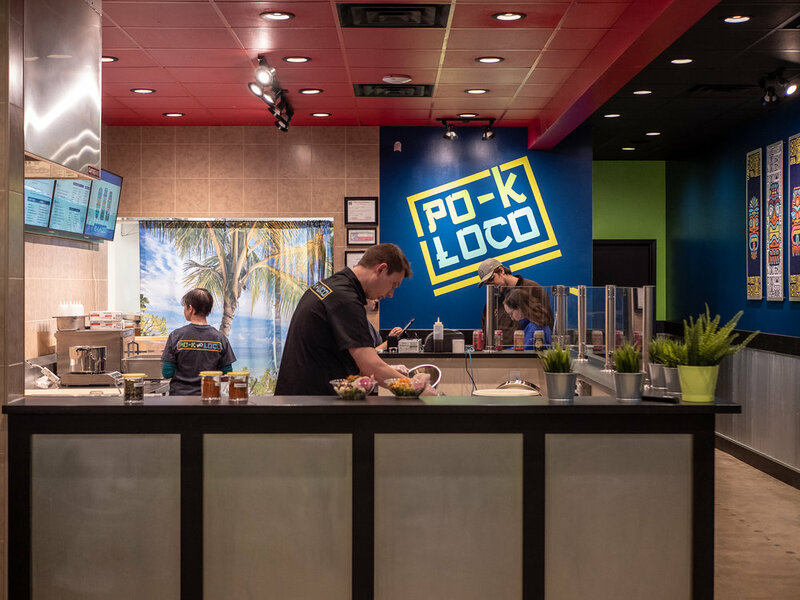 PO-K Loco offers up a more Californian take on the poke bowl, set up and style of the shop. 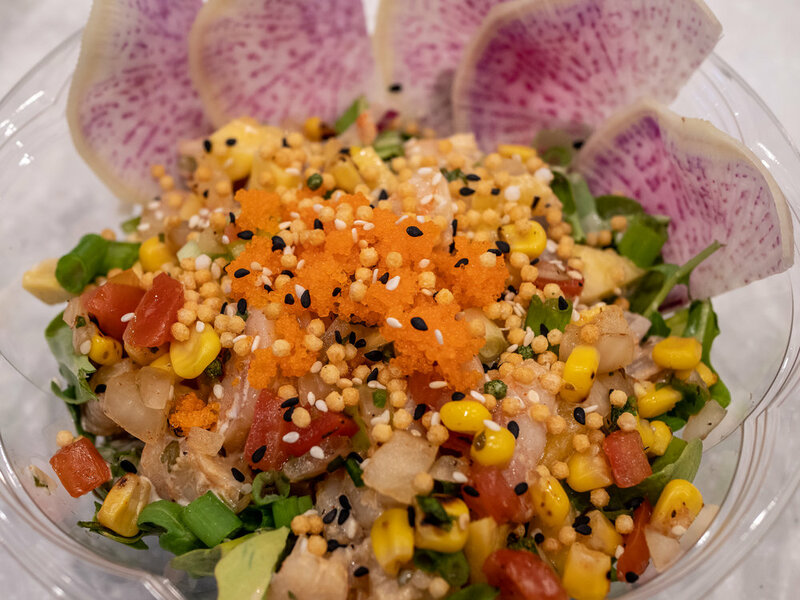 There are more flavor options than traditional Hawaiian poke, which gives the guest the option to customize to their taste. All of the sauces are made in-house and gluten-free, and many of the dishes can be made vegetarian or vegan friendly with protein options that include Ahi Tuna, Scottish Salmon, Ginger Chicken, Blackened Shrimp, Smoked Tofu and Beets. The only items in the whole place that have gluten are the fried onions, crab salad, furikake seasoning and squid salad. Coasted Toconuts was the first bowl we tried, and the base ingredients include a sweet and savory coconut curry sauce, fresh tuna, spicy peanuts and mint topped with toasted coconut flakes. You can also add up to five ingredients from the add-ons menu for free! We chose sushi rice and added guacamole, cucumber, pickled red onions, green onions, crab salad and pineapple. This one felt like eating a tuna tower and, after we mixed it all up, it was delicious. The guacamole has a lot of heat, in the best way, and works really well with the coconut curry sauce. The edamame bursts with flavor, and the brightness of the pineapple cuts through the more earthy elements of the bowl. The crab salad is sweet and delicate, and the tuna tastes fresh because it is cut fresh in the morning — and sometimes in the afternoon if demand calls for it. The next bowl was the Shaka the Beet, one of several vegetarian options on the menu. We had it served on a half-and-half mix of romaine and cauliflower rice. Served on top were beets, cilantro, jicama, korn pico and watermelon radish topped with a yuzu sesame sauce. The beets are diced just like the fish, creating the illusion of the most high-grade, freshly cut tuna — they eat hearty, taste earthy, and are deep with flavor. The combination of the crunchy watermelon radish and the nuttiness of the jicama add to the array of flavors present within the ingredients. The yuzu sesame is a bright addition to the more earthy and savory flavors, and we added sweet mango to really balance it all out and toasted shallots for texture. Lastly, but certainly not least, we had the Kapu Chow Chow that is served with blackened shrimp, mango, red onion, cilantro, cucumber, lime and topped with a wasabi ponzu sauce. The Chow Chow itself is like a ceviche without the protein, cooked by the lime juice with the addition of fresh garlic. We added wasago, fried puff rice and pico de gallo and had it served on a bed of arugula. This one was definitely more fork friendly, and the sauce was so tasty, bringing the right amount of sweet and heat to accent the ocean flavor of the shrimp which is cooked in cayenne oil and blackened. The arugula makes for a lighter option. The bowl also eats more like a salad, but the greens add texture and the sweet mango cuts through the heat with its sweetness. This was by far my favorite: put a lid on it, shake it up, and it keeps well for lunch the next day. 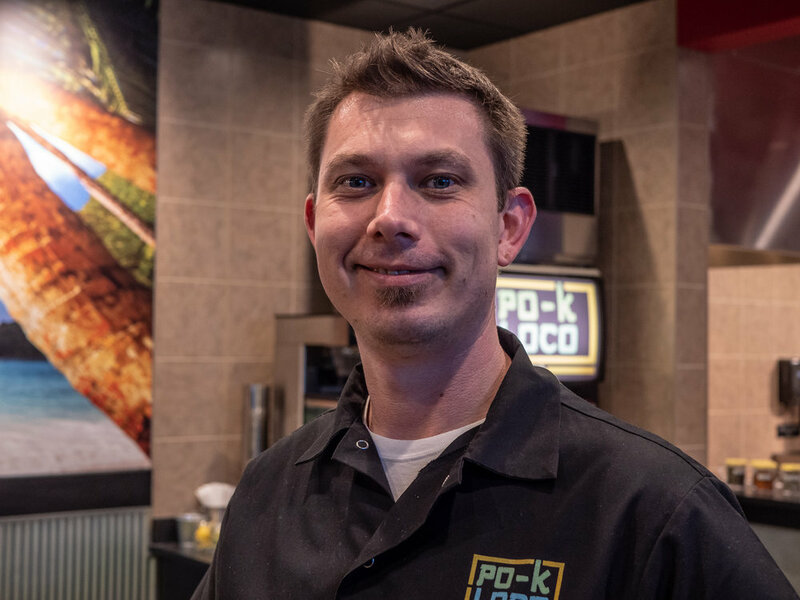 The menu is expected to grow and blossom as the crew at PO-K Loco gets more of a feel for what customers are craving and gets into their own business groove. With these affordably priced portions, you can load up with ingredients, pop on a lid, and have the perfect lunch option for students on the go — or even a speedy option for dinner if you are craving something a little different on your way home from a long commute. Don’t let parking hold you back. A cruise around the block can usually land you a spot, and your taste buds will surely be thanking you. Located at 119 Ave. A, Denton, TX 76201, and you can drool over all their food photos on their Facebook here.